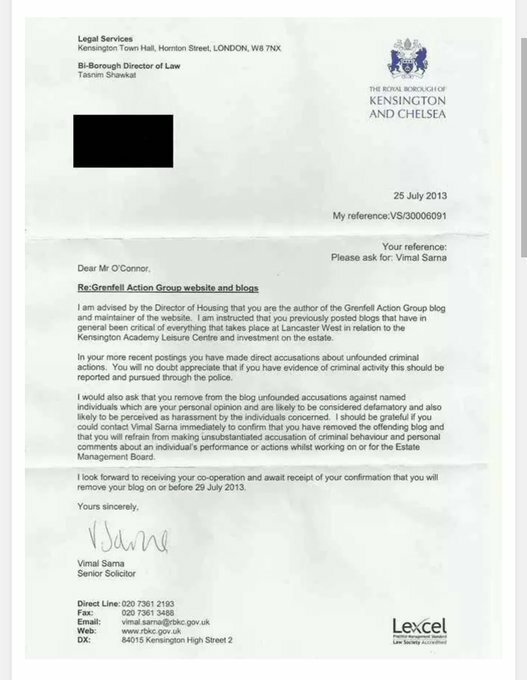 It’s emerged that the local Council – the Royal Borough of Kensington and Chelsea – actually threatened a local blogger and action group with legal action for calling to attention the state of the building. There’s a civil war going on in this country. No fire alarms, no fire escape, no sprinkler system. A tragedy waiting to happen. Absolutely horrendous footage. How on earth did it spread so fast? I’d start by looking at the use of flammable materials, mainly plastic, in exterior cladding. If I remember correctly was there not a similar type of fire at a 5* in one of the Gulf States. The fire was in Dubai,but also in Australia,all using the same flammable materials! Bert Logan beat me to it. I was going to post the exact same prophetic warning of fire danger in that block of flats. We have many people in the UK that are underemployed or working on zero hours contracts. This disaster can be directly related to the culture now being imposed on this country. If we do not employ people to ensure that things are done properly and to hold the cowboys to account we will have more disasters of a similar type; witness the girl killed in the East of Scotland when a school wall collapsed having been built by a private company and not properly examined during construction or on completion. I agree with your statement, but would like to add that” the people employed to ensure that things are done properly” and, more to the point, the people awarding the contracts are the real cowboys. The guys making six figure sums will be protected ,as usual. The small fish will fry. doubt through price ( or contacts) ) will be thrown to the dogs of Fleet Street. Totally shocked. My heart goes out to the people affected. You have expressed the issues so clearly and with so much angry and rightly angry sincerity. with respect to the blue light services WHO PASSES THE BUILDING AFTER 8.5 MILLION WAS SPENT ON IT ? When there is a tragedy in Govanhill what will you say? 15 people in a one bed flat, crammed in like rats in fire hotspots. Total lack of Risk assessments leads to a series of “Unexpected Consequences” that should have been considered and would therefore not be unexpected. And if you expect something like this to happen – DON’T DO WHATEVER IT IS YOU ARE PLANNING ! Simples ! It’s quite sad to actually not be surprised to read of parties sitting on safety reports and the knowledge that several parties involved (owner, building manager, renovation contractor etc) are breaking the law in several areas here. I feel like I have quite blatant right to say this because I’m an architect – quite simply if we don’t put in our building designs/work with other consultants for fire regulations and materials safety, buildings would not get built because it has to be assessed by drawings through building g regulations…its standard practice. If a building of this size doesn’t meet current building regulations, then even the people living there are responsible for addressing this – fire alarms, stair Wells, escape routes and travel distances etc – these are very basic, standard but fundamental elements for any type of building. This case does seem to me like a parallel universe where design standards and law don’t exist!! Also, architects/contractors/building managers are absolutely liable in this case regarding the refurbishments at the very least – indemnity insurance cover would be huge on a scheme like this for any if these parties, and even with this they would be serving prison time because of the loss of life. This is what would happen and has happened in multiple cases elsewhere…If relevant parties are not prosecuted here then it is a very obvious sign the current governments hand is involved here, and a separate agenda is apparent. I wish this had never happened. But I wish this had happened before the election, instead of after. I’m also an architect, this is lawful practice and HAS to happen in every building – even on house extensions, let alone tower blocks. Just read the branding ‘corporate manslaughter’…If I’d done this in practice then I would be now in prison, court action is essential but this will be a case where there is various individual and political wriggling for years, then individuals will be fined and slapped on the wrist under the current overall system. Like the effects of eating far too much sugar, the uncontrolled greed intrinsic to Neoliberalism and which is at the root of the terrible Grenfell fire disaster, has created something rotten in the British Establishment. Like a rotten tooth, it would be best to have it extracted altogether, but the ruling elite will strive to avoid this at all costs, and will advocate drill and fill instead, and will bring to the fight to keep the rotten tooth all its resources, starting with the Government. The demise of the irredeemably corrupt British Establishment is what is now at stake and will occur by being cut off from the oxygen of public recognition and compliance. These will be replaced by public rage and revilement for which the increasing focus has been Theresa May and for which Grenfell Towers is perhaps the last straw. Question: Is there a grassroots website that tries to build up an account for all the residents in Grenfell Tower? With all the uncertainty regarding the official numbers on victims, it might in stead be possible, through the contribution of survivors and relatives, to reconstruct who lived in which flats on which floors. Through a joint investigative effort of this sort everyone of the residents might in time be accounted for, and thus, the official numbers could be thoroughly tested. With all the uncertainty regarding the official numbers on victims, it might in stead be possible, through the contribution of survivors and relatives, to reconstruct who lived in which flats on which floors. Through a joint investigative effort of this sort everyone of the residents might in time be accounted for, and thus, the official numbers could be put to the test.